Left the El Paso Hostel at 6:30 am. Stopped at the Carlsbad Caverns. Took the elevator all the way to to bottom. Phew! Check out their web site. After the caverns, I drove on to Brantley Lake (saw a pair of nesting road runners), but the tenting area was way too far from the lake so I moved on to Bottomless Lakes State Park where I could set up my tent practically right next to the water. 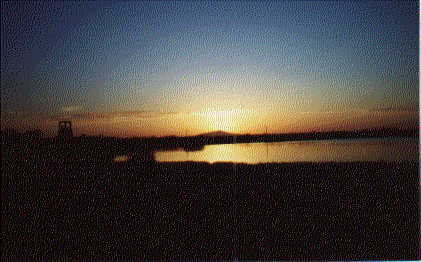 The lake is located 12 miles east of Roswell. The water is clear, visibility is 50 to 60 feet. After a relaxing night at the lake, I drove to Roswell and visited the UFO museum. While in Roswell I bought the usual 17 post cards, and stopped in a Chinese Restaurant--I needed food, air conditioning, and a large table to fill out the post cards. Then drove on to the Oscuro High Desert Hostel Ranch. 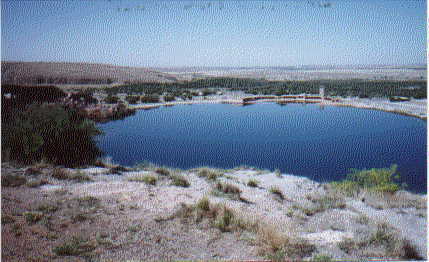 Spring fed Lea Lake is the largest of the Bottomless Lakes. The depth of it's cool, clear water ranges from 17' to 90'. Took a cool swim in the evening. The lake was deserted, quiet and still. Heaven. Mine was the only tent in the park. There were a couple of RV's. That night it got very windy. Had to get up and go outside to find a way to secure the tent flaps. It was cool when I first got up in the morning, but it heated up very quickly.